In Mumbai (formerly Bombay), the capital of the state of Maharashtra, the climate is tropical, hot all year round, with a long dry and sunny season from early or mid-October to early June, and a rainy season due to the south-west monsoon, from June to September or early October, characterized by stuffy weather, cloud cover and frequent rains, which occur almost every day and are sometimes torrential. In the pre-monsoon period, from March to May, the heat becomes intense, in fact, sometimes the temperature can reach 38/40 °C (100/104 °F); this partly happens also in the period following the monsoon, in October and November, when it can reach 36/38 °C (97/100 °F). In winter, from December to February, the weather is normally hot and sunny. During the day sometimes it gets very hot, in fact the temperature can reach 35/36 °C (95/97 °F), while at night it normally returns below 20 °C (68 °F), and from time to time it can drop below 15 °C (59 °F): it is better to bring a sweatshirt for safety. As mentioned, the monsoon in Mumbai lasts from June to early October and is definitely intense, since the wet currents come directly from the sea: in July, up to 800 millimeters (31.5 inches) of rain fall. In July and August, the sky is almost always cloudy, and relative humidity is very high, although the sea breeze gives a bit of relief. In Mumbai, rainfall amounts to about 2,250 mm (89 in) per year. 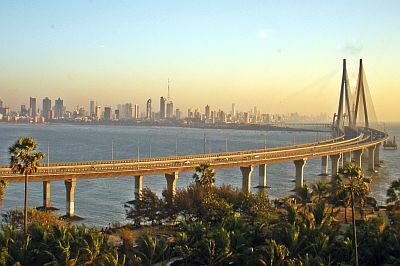 The sun in Mumbai regularly shines in the dry season, while in the rainy season the sky is often cloudy, especially in July and August. In theory, from April to December Mumbai may be affected by tropical cyclones, although they generally affect the areas to the northwest and to the south of the city (or at least this is what happened over the last decades). The fact remains that the city can be brushed by a cyclone passing over the ocean at some distance, and capable of bringing heavy rains to the city, as happened with Cyclone Phyan in November 2009, and with Ockhi at the beginning of December 2017. The Arabian Sea is warm enough for swimming throughout the year, as you can see in the following table. The best months to visit Mumbai are January and February. In November and December, the rains have usually ceased, but sometimes a cyclone can affect this area. In March, it starts to get very hot.